It’s nearing the end of the month, and suddenly the sales pipeline is flooded with prospects who are now magically in the discovery stage. Or, prospects who weren’t there yesterday have time traveled to the proposal stage. 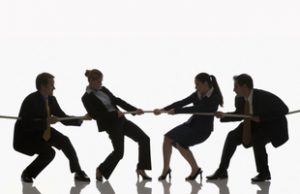 Unfortunately, this is fairly commonplace as sales and management play tug-of-war during the pre-sales process. The reality is, the qualification and discovery stages are more than just check boxes in the pre-sales process. If these steps are not done correctly, major complications may occur in scoping the project and implementation. So how do sales organizations ensure a smooth process that starts with the sales person and flows through the proposal, into operations, and eventually implementation? Is the Prospect Ready to Move Forward? Whether salespeople want to admit it or not (or even realize it), one of the most important conversations they have with prospects is the discovery call. This interaction uncovers whether the prospect and the product or service are a good fit, determines if there is a path forward, and sets the tone for the operations team and the post-sales process. 1. Qualification – In the first step of the pre-sales process, it must be decided if the prospect is a good fit and should be pursued. Is the prospect the right size? Is it the right type of company? Are they looking to purchase a solution or product? 2. Discovery – With some qualification built-in, discovery is more about how the product or solution will fit with the prospect, and often relies on the technical knowledge of a sales engineer. In this phase, the salesperson will gather data to ascertain the customer environment and validate the qualification process to understand if the prospect is ready to move forward. What is the current technical environment? What are the pain points that the solution must resolve? What needs to be accomplished? 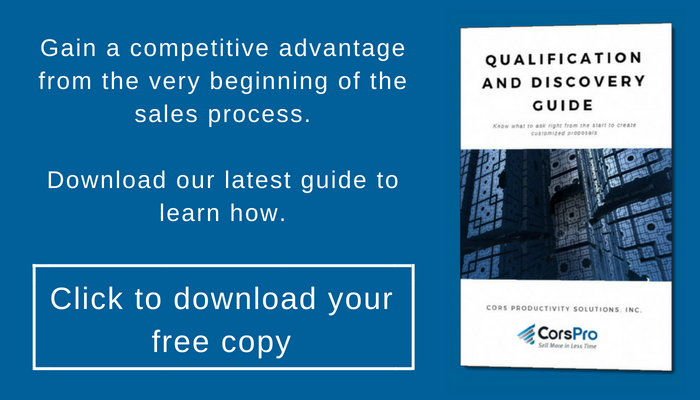 Click to download your free guide to Qualification and Discovery to best set your customer expectations. While every sales organization does qualification and discovery to a certain extent, we’d go out on a limb and say most are not doing it well. For sales people, it seems like wasted time when all they want is the sale, while management is on the other end demanding more information in fear of scope creep. However, the lack of compliance can’t all be blamed on laziness. It’s a problem of instilling the value of building an arsenal of actionable data. It must be based on a predefined set of questions to help businesses avoid misunderstanding after the sale and the inevitable change orders that erode margins. If a sales person has all the correct questions to ask, but omits asking them in the initial discussions, problems can occur later on in the sale process. Take for example what can happen if questions about the customer’s network aren’t raised. Imagine a network issue is uncovered during the implementation process because a network assessment wasn’t completed. The sales person might want to point fingers and say it’s an implementation problem, when in fact it was a gap in knowledge of the existing components. Instead of requiring a network assessment or divulging the network requirements of the solution, the sales person assumed the responsibility was with the operations team. If proper discovery had occurred, it would have been clear from the beginning that the solution wasn’t the right fit or the network required improvements as part of the implementation. In situations like these, sales is stuck with either charging the customer more via change orders to fix the underlying issues (which the customer won’t feel responsible for), taking a hit to the project’s profit margin, or reworking the scope of work (SOW). An informal qualification process that only includes a handful of key questions to determine if the prospect is a good fit and a set of forms for detailed discovery are not effective. These hard to follow and mundane processes aren’t just difficult for the sales organization; it also reduces satisfaction as the customer journeys through the sales process. Processes that include automation and enforcement mean that qualification and discovery are streamlined and made consistent so nothing is forgotten or assumed to be someone else’s responsibility. Automation takes the information gathered and brings a heightened level of detail to the SOW and executive summary, demonstrating a competence and attention to detail on behalf of the sales person to the customer. Through these improvements, sales can minimize margin-eating scope creep that results from assumptions about the work to be provided. Which processes need to be improved? What other questions could help us avoid these issues in the future? How do we set customer expectations to lead to better customer satisfaction? Auto-configures the products and services, along with the SOW language around what is included and excluded in a solution based on the answers from the qualification and discovery process to avoid scope creep. Leverages information like descriptions of pain points and areas of need for other outputs like discovery memos, proposals, and executive summaries to display that you have listened to and understood the prospect’s needs and concerns. Since SalesDoc Architect is built on Microsoft Excel, formulas are used to drive the automation process. This means that during qualification and discovery, the important details can’t slip by as initial answers lead to more in-depth questions that help to flesh out the scope of a project. At CorsPro, we understand that improving your sales process isn’t limited to adopting a standalone software solution. That’s why SalesDoc Architect comes with so much more. With roots in the technology integrator space and a diverse client base, the CorsPro team has had extensive experience with the qualification and discovery process.